A year ago Beastie Boy Adam “MCA” Yauch passed away after a battle with cancer. May 3rd is now MCA-DAY in New York City, a shout out to the rapper/activist who helped launch the Tibetan Freedom Concert in 1996 and spent a good portion of his life speaking up for Tibetan independence. 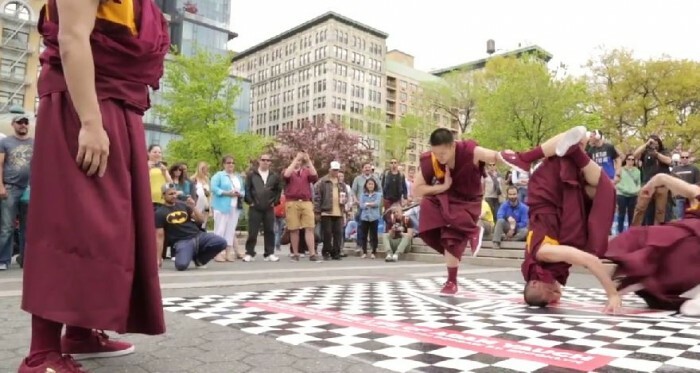 These Bhuddist monks paid homage to MCA and it’s pretty awesome. MCA-DAY “Buddhist Monks” from KNARF® New York on Vimeo. > 10 Reasons why Buddhism is Better than your Religion. Would it be okay if they were wearing Christian clerical vestments as they busted a move? Really? Don't believe these guys are monks.